As the carrier of a rare gene, Jax has the ability to jump ships through grimspace-a talent which cuts into her life expectancy, but makes her a highly prized navigator for the Corp. But then the ship she’s navigating crash-lands, and she’s accused of killing everyone on board. It’s hard for Jax to defend herself: she has no memory of the crash. Now imprisoned and the subject of a ruthless interrogation, Jax is on the verge of madness. Then a mysterious man breaks into her cell, offering her freedom-for a price. March needs Jax to help his small band of rogue fighters break the Corp monopoly on interstellar travel-and establish a new breed of jumper. I like SciFi. I really, really like it. Reading it? Eh, depends. I do love Fantasy, Urban Fantasy, cozy mysteries, and really, just across the board when it comes to what I will read. Science Fiction is something I generally WATCH rather than read, I am not sure why, but when it comes to the written form I have a harder time getting in to it but put it on the screen I am hooked! I am a huge fan of Firefly/Serenity, Star Trek, Stargate Franchise and many others. 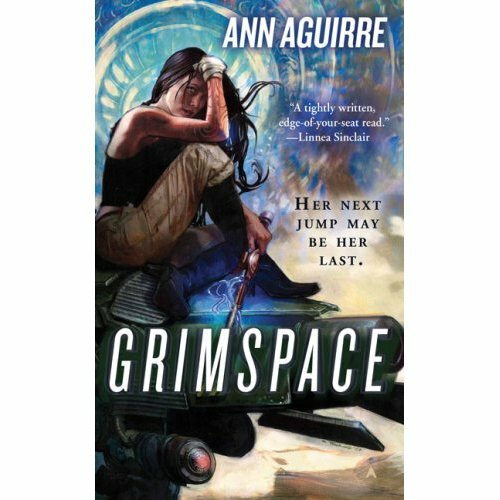 I came across a copy of Grimspace and thought what the heck? Might as well give it a shot. I am so glad I did! From page one, I was sucked in and the story refused to let me go! Sirantha Jax is a force to be reckoned with a very broken, yet solid female lead and her uniqueness as a Jumper and her history made her a very edgy, yet likable character. March, (a Psi) her pilot and lover, is another broken but very solid character. The dynamics of their relationship and adventures is one of which, as a reader, you hope and need them to succeed. I find that as complicated as it is, it's real and they need each other. Hell, I need March and Jax to succeed! The Universe that Aguirre creates is amazing. The characters are all outstanding. I love Dina, Doc, and Velith (who although he appears near the end, is one of my favorite key characters in the sequels). I am currently on the third book, Doubleblind, after finishing Grimspace and Wanderlust (#2) and Jax is staring at me from the cover of Killbox (#4) giving me the look that I better hurry up and read as she has more to tell me. Sigh. I have hooked my coworker on this series. I hope more fall in love with the Jax/March and their Universe. Disclaimer: This book was purchased by me out of my pocket. Sooooo, no need to disclaim about being honest and impartial. LOL. Except, I do get a small commission (REALLY SMALL) if you click on the amazon.com link and make a purchase. You really should, this is a GREAT series! Thanks for the recommendation. Your review had me thinking about which rare gene I'd like to have and what it would allow me to do. I'm going to have to look for this next time I'm out...it sounds like something I would like but maybe a book I would need to read the first few pages before I bought it. Thanks for the review. This is an excellent series! Definitely give it a try sometime. I highly recommend this series for fans of Babylon 5, Farscape, Firefly, etc. Good stuff!